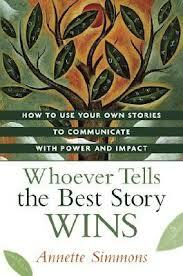 Story telling is a powerful communications tool that is becoming more and more recognized in the business community. These stories are not the usual speech openers or ice breakers, but stories that will influence others to trust the storyteller and shape decisions and actions that are important to both individuals and organizations. As the author explains, we’ve been conditioned to believe that business communication should be clear, rational, objective, with no place for emotion or subjective thinking. Not true. The most powerful, persuasive communication has a human element: „Communication can’t feel genuine without the distinctive personality of a human being to provide context. You need to show up when you communicate – the real you, not the idealized you.The missing ingredient in most failed communication is humanity. This is an easy fix. In order to blend humanity into every communication you send, all you have to do is tell more stories and bingo – you just showed up.“ This book teaches readers how to tell six kinds of stories. Part 1 explains how to shift from normal „business thinking“ to story thinking. Part 2 describes the six types of story, and walks readers through the process of finding their own inspiring stories. Part 3 outlines five practical principles that maximize story as a tool to understand as well as persuade. Readers can also make journal entries to capture and develop story ideas. The book is – naturally – full of inspiring stories (some very funny). The style is lively and personal, yet eloquent and sophisticated.